Residents of The Aldridge Hotel in Shawnee enjoy a potluck dinner Thursday. The hotel is one of the many historic sites in Oklahoma that has been renovated with help from Oklahoma's historic preservation tax credit. The hotel, placed on the National Register of Historic Places in 2000, is now a 60-unit apartment complex for low-income seniors. The Aldridge Hotel in Shawnee, built in 1928, is one example of a historic building that rural advocates say has heavily benefited a small community in Oklahoma since it was renovated. More than $11.4 million was invested a two-phase restoration of the nine-story hotel, which is now a 60-unit apartment complex for low-income seniors. 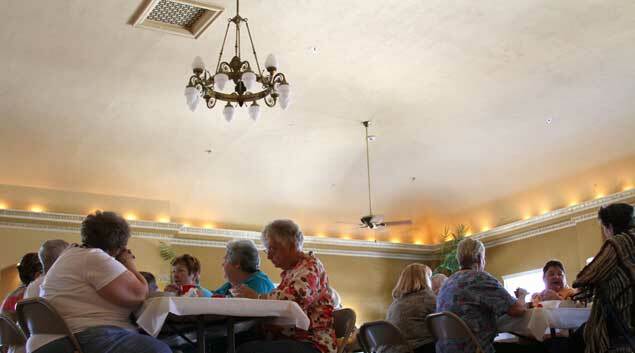 Residents of The Aldridge Hotel in Shawnee enjoy a potluck dinner Thursday. The hotel is one of the many historic sites in Oklahoma that has been renovated with help from Oklahoma’s historic preservation tax credit. The hotel, placed on the National Register of Historic Places in 2000, is now a 60-unit apartment complex for low-income seniors. Weeding through the politics of the current tax credits debate can be a daunting task, especially when one must factor in lobbyists, campaign contributions, party alliances and the ever-elusive motives of political gain. Yet, there is one more factor rarely discussed, a factor that is shaping Oklahoma’s future. Mike Southard, Ada Jobs Foundation president, fears the divide is becoming greater and will ultimately impact where the state invests its tax credits and incentives. Southard made that conclusion after attending the first hearing held by the Task Force for the Study of State Tax Credits and Economic Incentives in August. Southard pointed to Boeing’s plans to move more than 500 engineering jobs from California to Oklahoma as an example. The Aerospace Employer & Employee Tax Credit program is credited with playing a role in that decision – a study by Boeing and the Greater Oklahoma City Chamber shows will cost the state $3.5 million but is projected to infuse $270 million into the Oklahoma economy. Southard wonders if rural Oklahomans can successfully make that argument to the task force. He’s not alone. “Our voice in rural Oklahoma is barely being heard,” said State Sen. Tom Ivester, D-Sayre. “The bedrock of Oklahoma’s economy is the oil and gas industry and agriculture. As for oil and gas, outside of corporate headquarters in Oklahoma City or Tulsa, nearly all of the work is done in rural parts of our state. No one seems to think about that much. Then there’s agriculture. You won’t see big corporations coming to the defense of agriculture like they do with oil and gas. Why don’t we have any tax credits for rural farmers? The political gap between rural and urban Oklahoma is slowly widening. Redistricting for the 2012 elections is already complete, with 61 of 101 House districts going to counties with populations greater 69,700 – Oklahoma, Tulsa, Cleveland, Comanche, Canadian, Rogers, Payne, Wagoner, Muskogee, Creek and Pottawatomie. Those same counties will also account for 28 of the Senate’s 48 districts. While the redistricting process is, in itself, based on a complex format, Rep. David Dank, R-Oklahoma City, said the shift clearly gives urban Oklahoma “greater influence” and therefore more responsibility. “For the first time in state history, urban legislators will outnumber rural legislators,” said Rep. Dank, the task force’s co-chairman. “We have to remember the threshold for these tax credits is the cost-benefit to the taxpayer, regardless of whether you’re talking about 10 or 12 jobs in Sapulpa or 200 jobs in Oklahoma City or Tulsa. Mark VanLandingham, The Greater Oklahoma City Chamber’s vice president of government relations and policies, doesn’t buy into the notion there is a growing imbalance in power between rural and urban Oklahoma. Instead, small businesses now are encouraged to apply for the Small Employer Quality Jobs Program, which offers cash incentives for companies in communities with fewer than 7,000 residents. The incentives, however, are tied directly to the creation of new jobs. There must be five new jobs for communities of 3,500 or fewer residents; ten new jobs for communities between 3,500 and 7,000 residents; and 15 jobs for communities over 7,500 residents. Yet not every tax credit or incentive is tied to job creation. The state’s Historical Preservation Tax Credit is a prime example and is also being heavily scrutinized, although some claim it spurred major revitalization projects statewide in Shawnee, Cordell, Ardmore, Sapulpa and other towns. In Shawnee, more than $11.4 million was invested a two-phase restoration of The Aldridge Hotel, a nine-story prairie “skyscraper” built in 1928 as the Hilton Phillips Hotel. The hotel, placed on the National Register of Historic Places in 2000, is now a 60-unit apartment complex for low-income seniors.